Fully furnished 2 bedroom, 2 bath with washer and dryer. Perched high above midtown east on the 35th floor on a double corner. Far reaching open views North and South over midtown and East to the River. The apartment is bathed in Sunlight and shares the floor with only 2 other apartment. 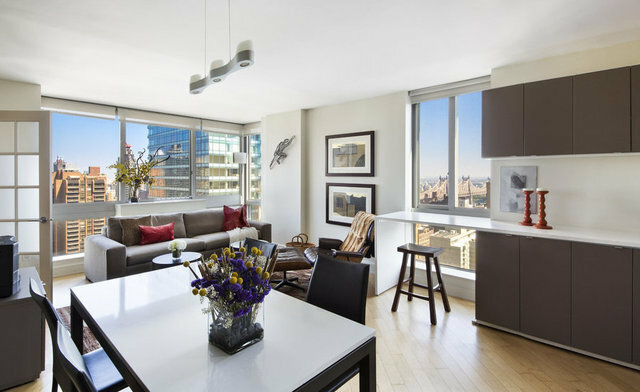 Full service boutique condo including white glove doorman and concierge. 40 Units total. Convenient to midtown financial offices, a plethora of restaurants and conveniences including the new Whole Foods 1 block away. The E/M/N/R/W/F/Q/4/5/6 subways are all nearby. Pets OK.